This navel ring is an exceptional piece. This unique navel ring have a black and white turtle as a bottom ball. 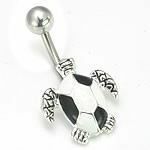 This turtle shell looks like a soccer ball and will make a sporty and stylish addition to any outfit.